If you know me, you know that sweet is one of my very few weaknesses. Lucky me (feeling so proud to tell) that Bangladesh has the longest list of sweets in the world. Amirti is not as popular as Jilapi. 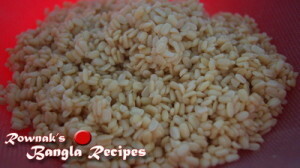 Jilapi and Amirti have similarity in taste. Normally Amirti is in dark orange colour. Enjoy. 1. Soak black gram for at least hour. 2. Make syrup with sugar and 1 cup water. We will get single thread syrup and keep it aside. We need look warn syrup. 3. Wash, drain and grind fine thick batter. Put 1 cup water little by little. 4. Add colour and rice flour; mix very well. Make it fluffy. 5. Heat oil in flat frying pan. Oil needs to be 1″ deep. 6. Fill the batter in the empty ketchup bottle and Squeeze it out in the lukewarm oil. For the traditional design, make a small circle around which make another circle and over these two circles make small rounds in anti-clockwise direction ending at the starting point. 7. Fry on both sides till crisp and takeout from oil. Soak it syrupfor 2-3 minutes. 8. Repeat this process with rest of batter. 9. Serve Amirti in room temperature. Sweets catagory seen are lucrative and hope will be tasty .But how i can get this . The recipe is clear . pl. send recipe for special Naru . I love Sweets and I know that my love for sweets shows in my recipes. 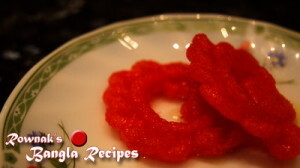 I want to gather all Bangladeshi sweets recipes(I know that its not easy tast, but someone needs to start). Humbly I will say that my sweets recipes are tested several and great in taste. Thanks.